If you need garage door repair services, you can depend on us. We are local and we specialize in residential doors repairs. Experienced in various types of openers in California, our technicians are trained to fix, replace and install them. Our team offers fast response repairs, replaces broken parts and installs new doors. It is the responsibility of Garage Door Repair Colton to make sure every inch of your door is properly installed and working the way it is intended to. If you need a reputable and efficient garage door repair company to attend to a problem you are having, we are happy to quickly attend to your needs. Let us know what is concerning you and we’ll arrange for one of our professionally trained, expert service technicians to access the situation. When it comes to delivering high quality service and products, you can always count on us. We specialize in garage door repair and installation. Along with our repair and installation services, we also offer you maintenance services. Many homeowners do not know about the different features of their garage door and how to care for them. It is important that you maintain the various parts so that it is operating smoothly and does not stop working. If your door stops working it could greatly inconvenience you and your family. If, for instance, the door suddenly stops when you are leaving for work or school, it may trap you inside. This can be avoided by taking advantage of our maintenance program. Let us take care of any problems you may have, before it ever gets to the point of becoming inoperable. When it comes to garage door repair services in Colton, we are generally chosen most often. We don’t want to waste your time by providing you with services you don’t need. This is why we access the needs of each customer on an individual basis. We never assume that we know what the problem is without making a thorough assessment of what it is that you need. Without doing this assessment, you may waste money on parts and labor that are not necessary. 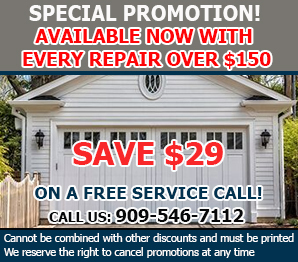 As the preferred garage door service in California, we get to the bottom of what is causing your door to malfunction. Our service technicians are trained in repairing garage door springs, openers, cables and every other component that is attached to your door. A proper assessment is possible when you use the services of qualified service technicians, such as, the ones we employ. We wouldn’t want you to worry unnecessarily about problems you may have with your door but we do want you to know that if you happen to notice anything wrong, we can handle it for you. You can be confident in our ability to find out exactly what the problem is and take care of it, usually, on our first visit. We would like for you to be prepared for what could happen to your garage door, over time and with continued use. Contact us today and let us discuss how we can keep your door operating at optimum capacity.